"It becomes very difficult and it does put our rescuers in harms way, because you have animals that can potentially try to bite or fight,” Rescue Lieutenant Jami Mitchell of Waterloo Fire/Rescue in Nebraska said by phone on Tuesday. "We’ve had some families that have had up to six dogs that were loaded on an air boat at the same time as the families being evacuated from flood waters,” she said. 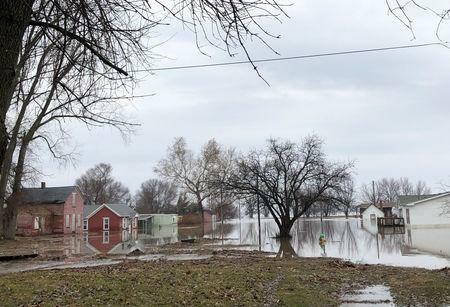 The rain- and snow-melt-induced flooding in the middle of the country's farm belt has killed at least four people and caused hundreds of millions of dollars in damage, killing untold numbers of livestock. "Standing in the cold water and being cold certainly isn’t good for the health of the animal,” she said by phone. "It's helped the folks staying here; they've been through enough," said Josh Murray, spokesman for the Omaha/Council Bluffs Metro Region Office of the American Red Cross.